My [Tessa’s] friend Amy Martin first saw Charlie at Evergreen Cemetery when she was there making a map of the cemetery for a cemetery maps zine she’s making. He’s named Charlie after the name on the grave she was sitting on when she saw him. She and I began going back to the cemetery every day with hotdogs to try to befriend him, but it was difficult because he was very shy and wouldn’t let anyone approach him. One of the cemetery caretakers told me that Charlie and another dog had been dumped at the cemetery a few months before, the other dog had since disappeared. Charlie was still there because they’d been leaving food and water out for him around the cemetery. He was covered in burrs and super dirty. 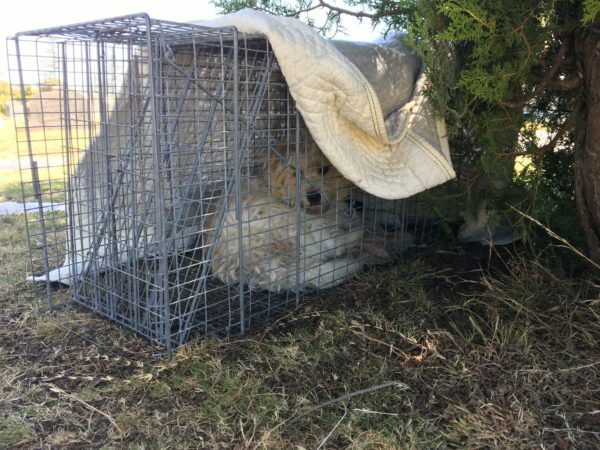 After a week of going to the cemetery and trying to befriend Charlie with hotdogs (which was working – he would come up and eat hotdogs if I was laying on the ground – but it was a slooooow process), we worked with Rocket Dog Rescue to trap him with a humane trap. When he came out of the cage at the Rocket Dog facility, we discovered that he is an incredibly sweet dog who has so, so much love to give. We’ve been fostering him for two weeks, and we’d keep him ourselves but can’t because of my health issues. So there you have it: a spoooooky graveyard terror — I mean, terrier! — who will give you all the smooches. Doesn’t look too happy to be rescued, huh? Or at least, not yet. Pictures from my friend’s back yard. 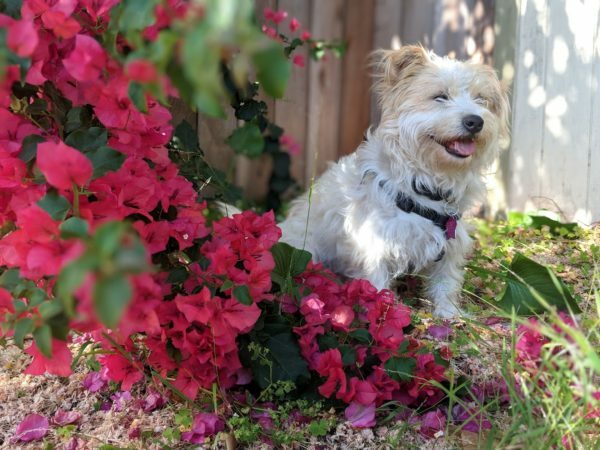 Charlie seemed to like the flowers! 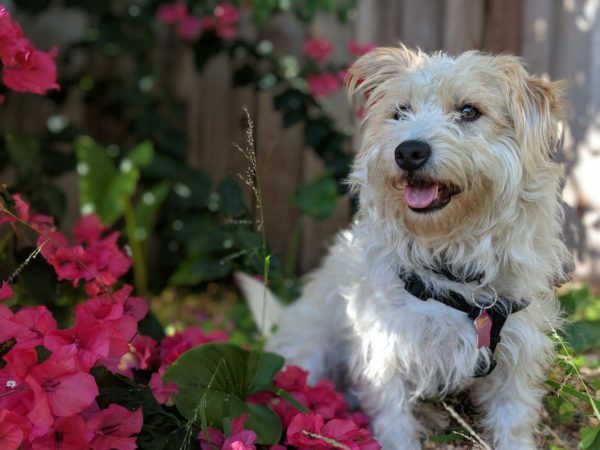 This entry was posted in Dog of the Day and tagged Adoptable, East Bay, Unknown Terrier. Bookmark the permalink.